This weekend was one that I have been looking forward to for quite some time. I was even more looking forward to it after none of my family made it in from Toledo for my Cincinnati baby shower. With my mom getting into an accident on her way down here (everyone was fine - that is why no mention prior to now. That and it made me really sad that she didn't come! ), and my sister having some other obligations with her husbands family, I was left family-less at my shower. Yes, J's family was there, but that is definitely NOT the same. I know that lots of husbands don't understand that, but I bet most women out there would agree with me. Friday night was pretty standard. Walking on the treadmill and getting work done in the afternoon, and then when J got home we headed across town to Jungle Jim's to do our grocery shopping. Jungle Jim's is kind of epic as far as grocery stores go. We have two locations here in Cincinnati, and they are HUGE. To think that this all started because of a guy selling vegetables (and other produce) out of the back of his pick up truck years ago... According to the Wikipedia page for Jungle Jim's, the market is over 300,000 square feet, and I don't doubt it. They have sections for all kinds of world foods, and have just about everything that you could ever hope to have. It really is a NEAT store. And, fun fact, the bathroom there has won Cintas's "Best Restroom in America" award. They are pretty sweet bathrooms. I rested on the couch for a while after we walked around the store. I have not been swelling too much, but I am doing what I can to prevent that as well. 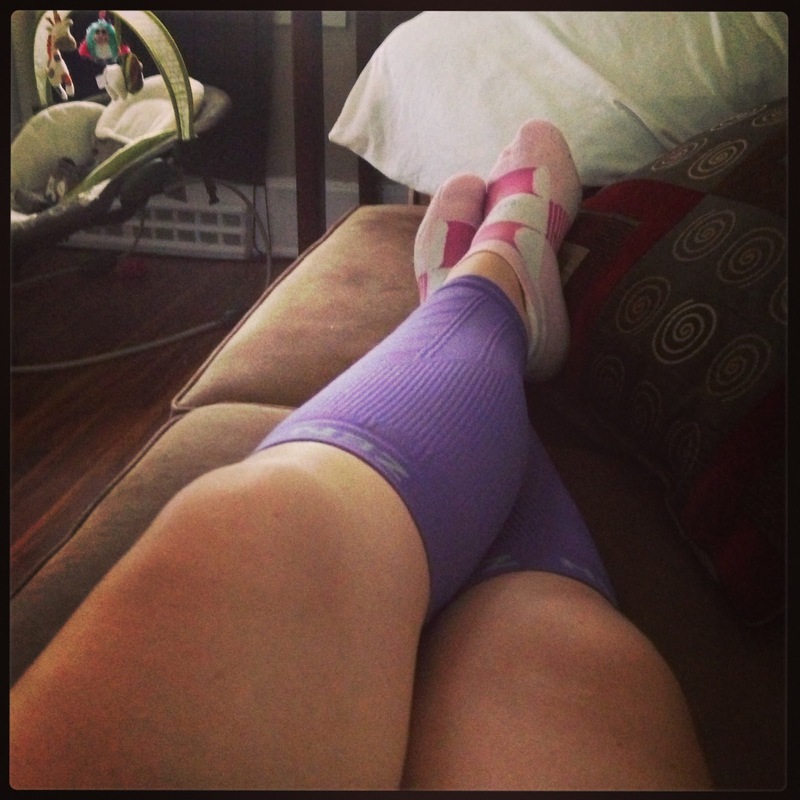 I love hanging out on my couch in compression. It KIND OF makes me feel like a runner still, even though clearly I am not currently one. And my running socks. Because clearly I was feeling like mentally depressing myself with as much running gear as possible (you can't see it, but I am also wearing a pair of Oiselle Roga shorts). We had sliders for dinner (a pull out of the freezer dream dinners variety), and they were ok. We would get them again, but they were not really anything special. The weekend was full of baseball games with a Reds win on Saturday and loss on Sunday (whoops... that was the one I was at and J's first Reds loss this season!) and lots more rain. Yesterday was pretty good, but it rained for the majority of Friday night and Saturday (but the game still was squeezed in!) My brother has gone home again (he left after the game yesterday), but it was really great having him here!